When winter weather hits, safety is our number one concern. Buses may experience delays or need to use alternate routes during severe weather. RideKC Freedom paratransit service may also be affected by winter weather. Check this website or call 816-221-0660 for the latest information about how conditions are impacting transit. Tune into local news broadcasts for announcements of service delays. Track your KCATA bus with WebWatch or the RideKC app. Find current information on social media or in the passenger bulletin section of our website. Use caution getting on and off buses, and walking to the stop. In winter, thawing and refreezing may occur; even if pavement looks clear, it may be icy. Each transit agency in the Kansas City area has its own snow plan whenever wintry conditions require rerouting normal service. The reroutes listed below are common problem spots during inclement weather. Make sure you are familiar with them before severe weather hits. Conditions may make additional reroutes and or delays necessary. 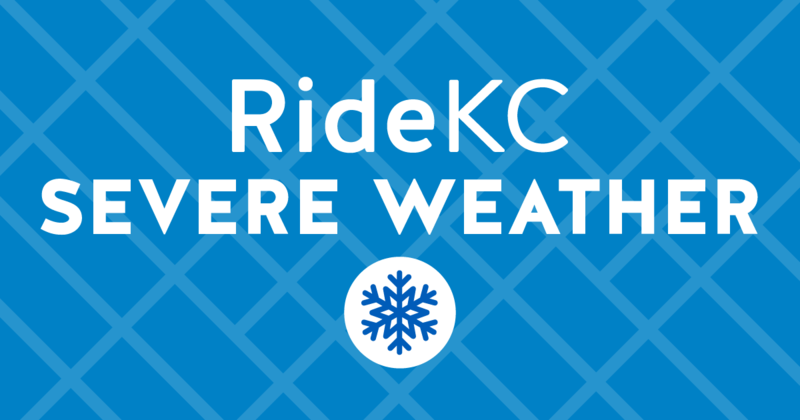 RideKC Freedom service may also be affected by winter weather. Check the list to see if your route is part of the Snow Reroute Plan. 10 Woodland-Brooklyn. Buses will not travel on Woodland or Vine between 18th and 25th. Instead, buses will travel on 18th to 25th via Brooklyn. 18 Indiana. 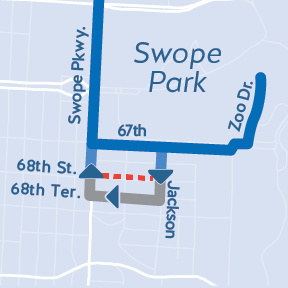 Buses will use 68th St. between Cleveland and Jackson instead of 68th Terr. 23 23rd Street. Buses will not travel to Blue Valley Court Townhouses. 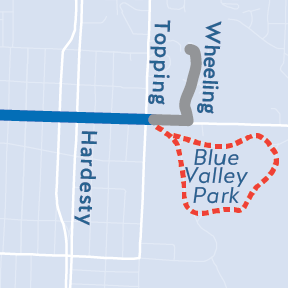 Instead, eastbound buses will enter Blue Valley Park from 23rd & Topping, circle and return to regular route at 23rd and Topping. 31 31st Street. 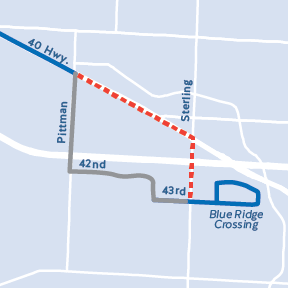 Buses will use 40 Hwy. to Sterling Ave. Buses will not use Pittman Rd. in either direction, nor travel through Stonegate Meadows Apts. 47 Broadway. 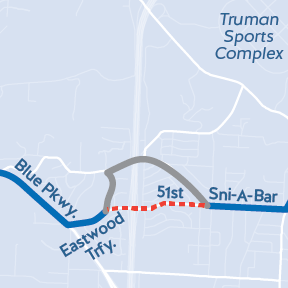 Eastwood Hills buses will use 51st St. between Eastwood Trafficway and Sni-A-Bar Rd., if Ararat is impassable. 52 Ward Parkway Limited. Buses will not use Madison or Belleview between 47th and Westport. Buses will use Roanoke then resume regular route. 571 71 Highway (a.m. only). Buses will use 71 Hwy. 71 between Red Bridge and Bannister Rd. Buses will not use Hillcrest in either direction. During bad weather, road conditions may not allow RideKC Flex to reach certain parts of a Service Area. Travel may be restricted to major streets. Customers may need to go to a major street to catch RideKC Flex. During inclement weather, call the RideKC Flex office at 816-346-0346 to check travel restrictions. 65th, Wayne, Flore & Shady Lane Rd. If you are a park and ride customer, please be aware that KCATA crews clear some of the park and rides while other park and rides are cleared by the owners of the property. View all Park and Ride locations. KCATA crews will be out long before rush hour on heavy snow days to make sure the following park and rides are cleared as quickly as possible. Other Park & Rides will be cleared by property owners as quickly as possible. When the RideKC Snow Plan is in effect, the Johnson County routes included in the table below may have limited service. On RideKC social media and on RideKC.org, look for this announcement: "Snow routes are in effect for a.m. and/or p.m. trips on [time]. Northbound trips will begin at [time] and southbound trips will begin at [time]." Plan to board your bus at your usual boarding location. 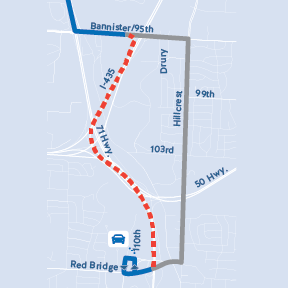 Upon the Snow Plan announcement, Johnson County routes will begin service so that northbound buses depart the designated location 90 minutes before southbound buses, unless otherwise announced. (Route 510 westbound will depart 90 minutes before eastbound trips). Overland Park Flex Service (482) will not operate when the RideKC Snow Plan is ineffect. All buses will travel the regular route, unless street closures or other road incidents require detours. Expect longer than usual wait times between northbound to southbound transfers at the Mission Transit Center. Southbound to northbound transfers will not be possible.